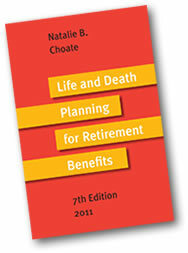 This .pdf document contains the entire Table of Contents from the 7th edition of Life and Death Planning for Retirement Benefits (2011) by Natalie B. Choate. If you own the book, download this document to someplace on your hard drive where you can find it easily. Then, when you need to look up something in Life and Death Planning for Retirement Benefits, you can do a word search in this document…that may help you get quickly to the page and section that answers your question. If you DON’T yet own the 7th edition of Life and Death Planning for Retirement Benefits, read the Table of Contents to see what the book is all about, and whether it provides information you need.